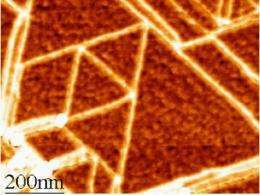 (PhysOrg.com) -- In a blown-up image from a scanning tunneling microscope, it looks just like an endless sheet of chicken wire: a simple flat sheet made up of a lattice of hexagons. But this nanoscopic material called graphene, first generally acknowledged to exist just five years ago, turns out to have a variety of unique, and potentially very useful, characteristics -- ones several MIT researchers are actively trying to better understand and turn into real-world applications. For starters, its unique electrical characteristics could make graphene the successor to silicon in a whole new generation of microchips, surmounting basic physical constraints limiting the further development of ever-smaller, ever-faster silicon chips. MIT has become a major center of work on this hot topic, with several different research groups pursuing various aspects — including physical, chemical, electronic and engineering — of the novel material. Graphene, a form of the element carbon that is just a single atom thick, had been identified as a theoretical possibility as early as 1947. Even as Institute Professor Mildred Dresselhaus, her physicist husband Gene, and others were working in the 1960s with multiple layers of graphene, many scientists were saying that such an ultra-thin sheet of matter could never be found or even made. “It was very controversial; there were many people who were skeptical,” about the research, she says. Now that it has been found, with widely publicized results published in 2004 by researchers at the University of Manchester, UK, “the topic has exploded,” she says. Researchers are focusing on how to harness its properties, and how trying to find ways to produce it in sufficient quantity for extensive research and eventually for commercial applications. Microchips is just one of the material’s potential applications. Because of its single-atom thickness, pure graphene is transparent, and can be used to make transparent electrodes for light-based applications such as light-emitting diodes (LEDs) or improved solar cells. The potential solar cell applications are now being studied by some MIT researchers including Associate Professor of Electrical Engineering Vladimir Bulovic and Associate Dean of Engineering for Research Karen Gleason. Graphene could also substitute for copper to make the electrical connections between computer chips and other electronic devices, providing much lower resistance and thus generating less heat. And it also has potential uses in quantum-based electronic devices that could enable a new generation of computation and processing. 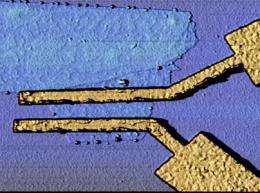 The mobility of electrons in graphene — a measure of how easily electrons can flow within it — is by far the highest of any known material. So is its strength, which is, pound for pound, 200 times that of steel. Yet like its cousin diamond, it is a remarkably simple material, composed of nothing but carbon atoms arranged in a simple, regular pattern. “It’s the most extreme material you can think of,” says Tomas Palacios, an assistant professor of electrical engineering and computer science and a leader of one of MIT’s research groups exploring graphene’s possible electronic applications. Palacios and his team just last month published new results showing that graphene can be used to make frequency multipliers that could enable much faster computer chips and communications devices. When she started working in 1961 on the properties of carbon and its many forms of atomic arrangements, it was not a popular subject for research, Dresselhaus recalls. “There were probably 10 people in the world” doing such research in the 1960s, she says. “Now there are thousands.” At the American Physical Society annual meeting last month, she says, there were more sessions devoted to graphene and related carbon research than any other subject. “This is by far the most popular topic” in physics today, she says. Carbon atoms have a propensity to bind very strongly to each other, as well as to other kinds of atoms. The molecular bonds they form are easy to make and very hard to break. That’s what gives carbon molecules and crystals their unrivaled strength. Graphite, the material of ordinary pencil lead, is essentially a jumbled mass of tiny scraps of graphene. The trick that enabled the first demonstrations of the existence of graphene as a real separate material came when researchers at the University of Manchester applied sticky tape to a block of graphite and then carefully peeled off tiny fragments of graphene and placed them on the smooth surface of another material. That method is sufficient for scientific research. “For the physicists, that’s all they need,” says Strano. “They don’t care if they go to a lot of effort to make five tiny pieces, they can study those for years.” But when it comes to possible commercial applications, it’s essential to find ways of producing the material in greater quantities. One of the MIT research teams, led by Jing Kong, the ITT Career Development Associate Professor of Electrical Engineering, is working on developing such methods. In preliminary work, they have created sheets of graphene by chemical vapor deposition, a technique that they hope can be developed could be used to make larger quantities of the material. Kong’s method uses equipment that is “very compatible to conventional semiconductor processing.” The method “is quite straightforward, and not too expensive,” she says, which could help to enable commercial applications. For specialized functions such as computer chips, further research will be needed to improve the quality and uniformity of the graphene sheets, she says, but for other applications such as solar-cell electrodes, the existing process allows the researchers to start the investigation. Are they removing your spam, Farbstein? Physorg, and all the other forums you spam, should be billing you for trying to advertise while breaching their terms of service.